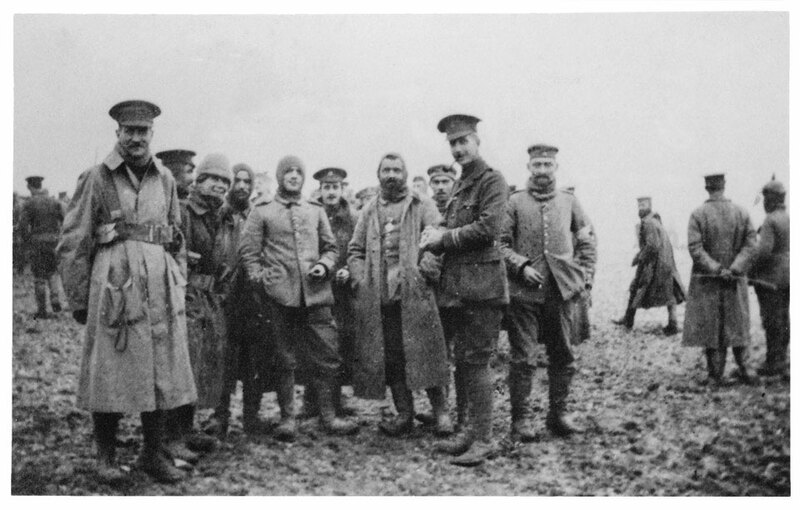 German and British soldiers together during one of WW1’s famous “Christmas Truces” in 1914. John Thompson, the Iowa Statesman’s new managing editor, asked me to write something for Christmas, since due to this publication’s very recent revival most columnists are either not up to speed yet, or are too busy or traveling for the holiday to turn content in. All things being equal, Christmastime is quite possibly the worst possible time to kickstart a digital magazine. But, as one of the few people who have managed to eek out a living in politics, I suppose John figured I accordingly have no life and nothing else to do, and would thereby make a good candidate for the job of providing content in a tough time to get content. Or maybe he just dislikes me…? Regardless of John’s reasoning though, I am pleased to do it and am thankful to speak to you on this wonderful holiday, and even more thankful that you, dear reader, would take time out of it to read my words. There is a downside to writing a Christmas column however; after all, there are pretty heavy expectations for a decent holiday column, and especially one for Christmas. What to write about then? As I sit here writing this, I have by now wondered that very question for the last several hours, turning first to current and local events for inspiration. Indeed, inspirations abound; the news is replete with stories about generous donations, about communities supporting families whose homes burned down this week, about families united, about lives saved and lives lost, and so forth. There are also, of course, numerous retellings of the meaning of Christmas itself. But you can all read that kind of thing elsewhere, leaving me with the persistent problem: What should I write about that is appropriately meaningful and worth reading on Christmas? As someone who has made it a lifelong pursuit to study history, and who even has a degree in the field, I believe the past—the year 1914 to be specific—holds the answer for me today, in 2016. This very moment, 102 years ago, the major powers of the European continent were freshly embroiled in what would eventually be called “The Great War” by those who lived through it. World War One was the first modern war, and many new technologies that are so familiar today were first utilized on the battlefields stretching from the shores of the North Sea in the Netherlands, virtually straight south into France. There, along this hundreds of miles long front that hardly moved in four years, the armies primarily of the United Kingdom, France, Germany, and Austria-Hungary, unleashed weapons against one another that theretofore had hardly or never been used: machine guns, chemical weapons, tanks, flame throwers, modern artillery, airplanes, bombs, modern land mines…The list goes on and on. The death tolls were dramatic, and shocked everyone on all sides. Imagine for a moment a world which had been accustomed to neat formations of men marching to within 100 yards of each other and firing a few volleys, abruptly and rudely confronted head-on with those same tactics being met with machine guns and poison gas and tanks. Where previously a bad day in battle was a few dozen casualties, now a bad day was suddenly measured in the thousands. Single battles in World War One had a million casualties. The folks back home in the UK, France and Germany were used to somewhat frequent skirmishes here and there; war was a fact of life for Europeans after all, going back hundreds of years. The little towns would mourn the one or two Williamses, the Jacques and the Hanses who were killed, their families and communities saying that they had died bravely for their countries. But now, in 1914, instead of the short, one and two name casualty announcements that only took up 2 column inches of the paper, nestled between news of the horse-and-cart accident and the Burgermeister’s secretary scandal, the casualty lists were suddenly several pages long, with enough names in them to require alphabetization, further segregated and categorized by the dates of death. Pause for a minute and reflect on this. The modern world was upon them, those virtual primitives, and they were fighting a 20th century war using 18th and 19th century tactics. Imagine the shock, the pause that must have given everyone. Imagine the consternation and the sheer panic and outpouring of dread and melancholy that swept across Europe. This was our brothers’ and sisters’ Christmas across the Atlantic 102 years ago. Hardly a joyous noel. Naturally, no one felt the pressure and the stress of these new and dramatic problems like the infantryman on the line though. Much to their surprise too, their war was nothing like the wars their fathers and grandfathers had told them about growing up, and they were in no way prepared for the challenges and the horrors they faced. Regardless of your knowledge of World War One, I’m certain you’re aware that trench warfare was the rule of the day. Given the situation, you can understand why the soldiers dug holes and hid in them. Nobody before had used the technologies now in their hands, and nobody really knew what to do with or about them since they were so new. So the men dug in and prayed, choosing to sleep in the mud and their own filth, with rats running around, over the alternative of stepping foot on the land above. It should not surprise you then if I told you that the soldiers of both sides, from every nation, grew quite cynical in a hurry. All soldiers are cynical to a point, but during World War One disobedience of orders and outright mutiny threatened to become a widespread problem. There are several recorded instances of it, many of which resulted in sad, shameful executions. Commanders, men who learned Napoleonic era tactics, were at as much of a loss as the men in the trenches, and they reacted in the only way they knew how. Shell Shock, or what we call “PTSD” today, was a rampant issue to a degree never seen before, and it caused more casualties than physical injuries inflicted by the enemy’s weapons. The effects of modern, mechanized warfare were too much for many to bear. The men in the trenches, surviving hour after hour, day after day, of artillery dropping down on them between mustard gas attacks, legitimately wondered: Why am I here? What are we doing sitting here, freezing in the mud, getting trench foot, lice, and fleas, and getting killed? It was a damn good question, and one which has kept military historians busy trying to answer ever since. And so, yesterday evening 102 years ago, the men on the front around Ypres, Belgium decided that enough was enough: It was time for a little peace on Earth, right in the midst of Hell. Legend has it that it all began with the Germans setting up Christmas trees, lighting candles, and singing carols. Germany is the birthplace of many of the Christmas traditions we Americans are familiar with, and so, true to their traditions those “Boche”, as the French called them, decided that they weren’t going to let a war stop them from taking a break from the misery by celebrating their culture’s most popular and meaningful holiday. The British and Commonwealthers, being a competitive lot, heard the singing and saw the trees, and figured they couldn’t be outdone. Thus they began singing carols back at the Germans, because after all they loved Christmas too, and what the heck, why not? As you can no doubt guess, it didn’t take long for a white flag to go up, and a few nervous men to hop up out of their trenches and tenuously step foot upon the barren wasteland between them. With much trepidation the men of both sides approached each other, first with uncertainty and thoughts running through their minds of a shot ringing out and putting them down right there for being so foolish…Then, at last, when that very reasonable fear failed to come to pass and dirty, frozen hands were extended and shook, smiles flashed across tired, unshaven faces, and the obligatory “Merry Christmas!” and “Fröliche Weihnachten!” salutations finally exchanged, something magic happened: A truce was unofficially declared…Not via orders from anyone’s high command, safe in tents miles to the rear, but instead a truce resulting from a truly democratic movement borne out of the tired hearts of battle worn soldiers in the field. It was decided then and there in the midst of the smoky, crater filled “No Man’s Land” where thousands of bullets had streaked through the air minutes before, decided there amongst the men themselves—men who according to their governments were sworn arch enemies sent to kill in the name of God—that there would, in fact, be no killing on Christmas. These little unsanctioned truces spread up and down the line in all directions, amazingly most without knowledge of the others. Commanding officers on both sides were livid and sent messages to resume hostilities at once. Those messages were promptly disregarded. The men were tired of the war, and they were sitting Christmas out. So instead of exchanging fire, they exchanged food with one another. 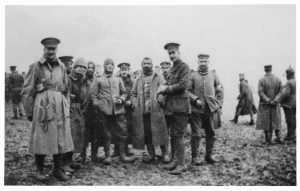 British and French soldiers ate with German soldiers in German trenches, while German soldiers ate with British and French soldiers in British and French trenches. They showed each other photos of their families and traded addresses so as to write one another when the war was finally over. They put each others’ clothes on, laughing heartily at the comical role reversals. They gave away their mittens and scarves and hats to help their enemy keep warm in the European winter, and traded personal trinkets, medals and other bits of their uniforms as keepsakes. According to some stories, they even played soccer. And yes, as it all began separately, they eventually sang their carols together. Strains of “Stille Nacht, Heilige Nacht” alternating with verses of “Silent Night, Holy Night” could be heard drifting over the war destroyed fields of western Europe on the night of December 25, 1914. To the relief of London, Paris and Berlin, the war eventually resumed. World War One would drag on another four years, ending finally when the United States entered the conflict, raising a 3 million man army and landing 10,000 of them per day on the shores of France by the spring of 1918. Our presence disrupted the tense equilibrium of the European powers, which allowed the Allies to successfully wage a counter-offensive against the Axis powers and finally drive them to capitulation. Thus on 11:11 PM, on the eleventh day of the eleventh month, The Great War was finally over, and what collectively became known as “The Christmas Truce” was soon a distant, nearly forgotten memory; a small bright spot in such unspeakable darkness. When the dust and smoke finally settled and the bodies were counted, there would be 40 million military and civilian casualties. The land and the water were destroyed and poisoned, and the collective economies of Europe were ruined which in large part led the world into the Great Depression a decade later, an event which would itself result in millions more deaths. In comparison, the First and Second Balkan Wars, the major European wars preceding World War One, “only” resulted in 600,000 casualties. America’s most deadly war, the Civil War, “only” resulted in approximately 1 million casualties, also military and civilian combined. Little did they know at the time that World War One was merely the opening act of World War Two, a conflict that within 25 years would result in over 100 million more casualties and the near-complete destruction of Europe and Russia. No, nearly 98 years ago on November 11, 1918 at 11:11 PM, all the western world knew was that “The War to End All Wars” was finally over. Thank God. In July 1914, a handful of cultures and peoples which had nearly everything in common decided to go to war with one another over what, in hindsight, seem like light and transient causes but which they felt worth bringing their entire shared civilization to the brink of destruction over. You and I, dear reader, are partisans in the midst of the greatest period of domestic political strife in over 150 years. Inspired by what the enemy soldiers at war with each other in the trenches did in 1914, I wonder: Is it possible for us to realize that most of those who oppose our positions and policies are nonetheless still fellow Americans who share most of the same cultural traditions and values we hold so dear? And in so doing, is it possible for us to call truces, even temporary ones, to do some of the right things together? Just like World War One didn’t end on Christmas 1914, I’m not so idealistic and naïve to think that our partisan conflict will cease any time soon. Nor do I believe for a moment that there are not very important things that require fighting for and against. But is it possible to remember that, while also conducting ourselves honorably and without the present acrimony? Is it possible to realize that our animosities, typically ginned up by outside forces, usually benfit those outside forces more than us? Can we see how much easier it is to seek the destruction of our opponents when we call them, metaphorically speaking, “the Boche”, reducing them down to caricatures and demonizing them as “Other”? Can we still recognize that they’re our neighbors who have more in common with us than different, thus requiring us to meet each other on open ground as equals? If a bunch of British, French and German soldiers can stop literally killing each other in recognition of their shared agony and shared culture while engulfed in the then-greatest conflict in world history, producing one of the greatest recorded Christmas miracles, can Republicans and Democrats recognize our ill-treatment of one other and find enough common ground to declare a ceasefire in time to do right by each other and the people depending on us, preventing the ruin of us all? We are told to love thy neighbor, because as history shows us the alternative is too terrible to conceive. But the best part? It starts with you, and it starts with me. It starts with all of us individually, requiring nothing of us but to lay down our proverbial arms, put up the white flag, step out into what is now the political No Man’s Land, and extend the hand of benevolence. We don’t have to agree on everything—or heck, even anything. We just have to remember we’re all in this together. That would truly be a Christmas miracle. I’m certain I speak for all of us here at the Iowa Statesman when I say that we wish you and your families a Merry Christmas and Happy New Year. May the joyousness and merriment of the season be with each and every one of you, and I beseech the Almighty God to lay his blessings upon you all. Merry Christmas, everyone…And Fröliche Weihnachten too.